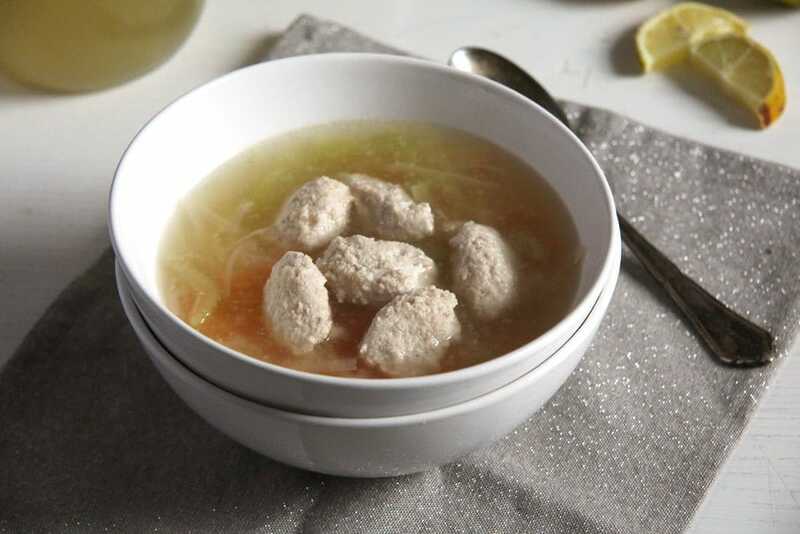 I have a hate/love relationship with this soup, meaning that I totally hated it as a child and was appalled every time my grandmother put it in front of me, but totally loving it now as an adult. The reason I didn’t like it as a child was the cooked peppers in it, if there was one thing I could not bear then, than it was cooked peppers. It came from being forced to eat them in kindergarten, one of the women in charge of us there piled all the cooked peppers and tomatoes leftover after eating the soup on a spoon and literally shoved everything down my throat, forcing my mouth open and pushing the stuff inside with the spoon. I tell you, that caused a lasting impression, I first ate cooked peppers again when I was 23. This is also the reason why I never asked my grandma for the recipe for this soup. I thought I would never make it anyway, so why bother. But then, a few years ago, when I visited my hometown I ate this soup cooked by my aunt. And loved it sooooo much, I immediately had to have the recipe. And the period I cooked this the most was while I was pregnant with my daughter. No wonder she likes it so much! 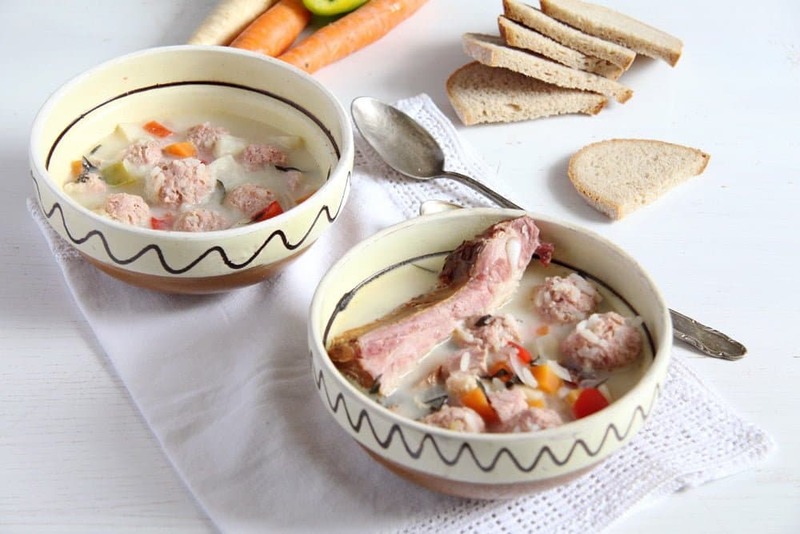 It is a really typical Romanian soup, ciorba de perisoare, another one of those items you will find a recipe for in each and every Romanian family. 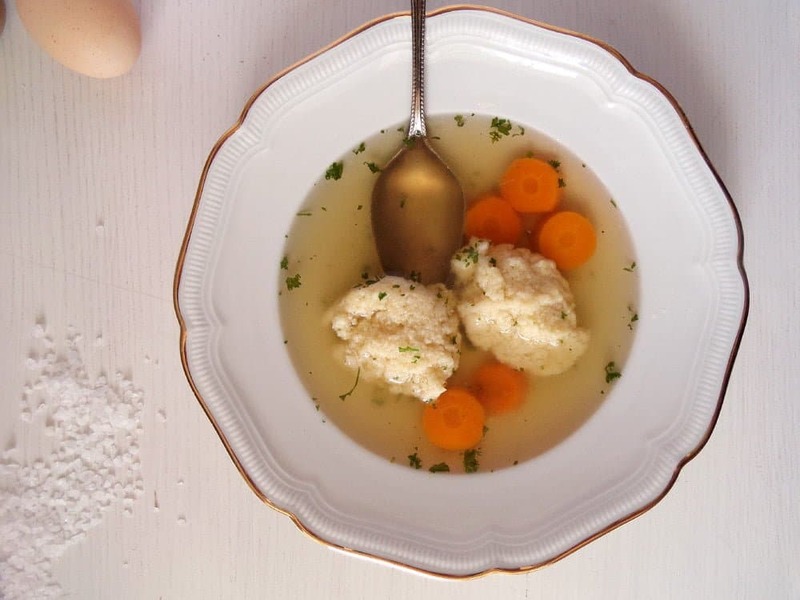 It must be the most popular Romanian soup right after the Semolina Dumpling Chicken Soup. It is eaten all through the year, but you can be sure to find this on the Easter or Christmas table as well, it would be either this or the chicken soup. 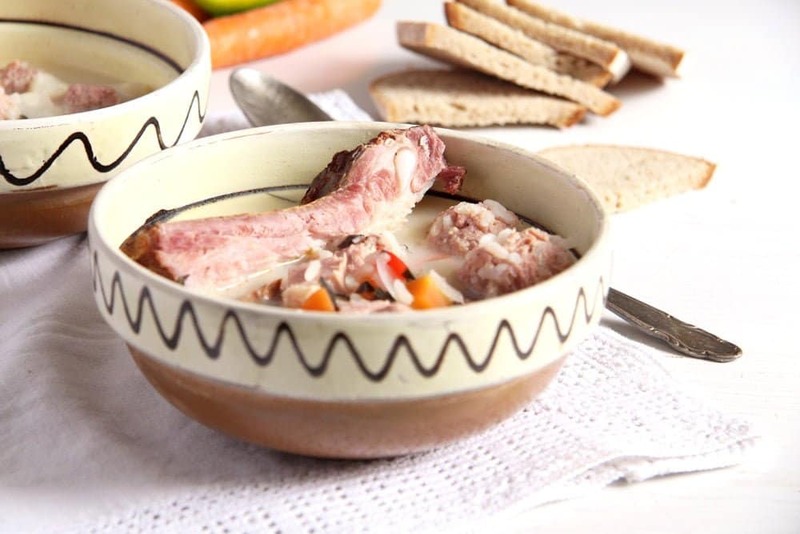 It is a very comforting, nourishing soup, one slice of bread and some hot, pickled Romanian peppers on the side and you will be satisfied on a regular day. But not on Easter Sunday! This would be just an appetizer, alongside the Boeuf Salad and the red eggs, the mushroom salad with mayonnaise, salami/ham-cheese rolls, meatballs, the green onions, radishes and the bread. Followed by a big roast with potatoes and the meat-cabbage rolls with sour cream, more white bread or polenta. And then again followed by the sweets. I am telling you, you leave the table weighing at least two kilos more. Such a meal takes hours and hours of course, and that is something I really miss about Romania. In Germany, we sit down to eat Easter or Christmas lunch at my mother-in-law’s at one o’clock and are finished in half an hour. A piece of meat with potatoes or dumplings, some vegetables on the side and the sauce, followed by dessert. Everything very nice and tasty, but I always wonder, why do we have to eat so quickly? The best part of this celebration is sitting at the table, chatting, laughing, having a bite every now and then, enjoying a meal that you do not eat on a normal day, so where’s the hurry? I tried to change that when we have a celebration meal at my place, but there’s no use. You cannot change the life-long habits of so many other people. It would be nice to have an Easter lunch at my aunt’s place someday. She cooks more on this occasion than anyone I’ve ever met and she has a huge family, so her house is always full, not just on Easter or Christmas but every day. Maybe next year! 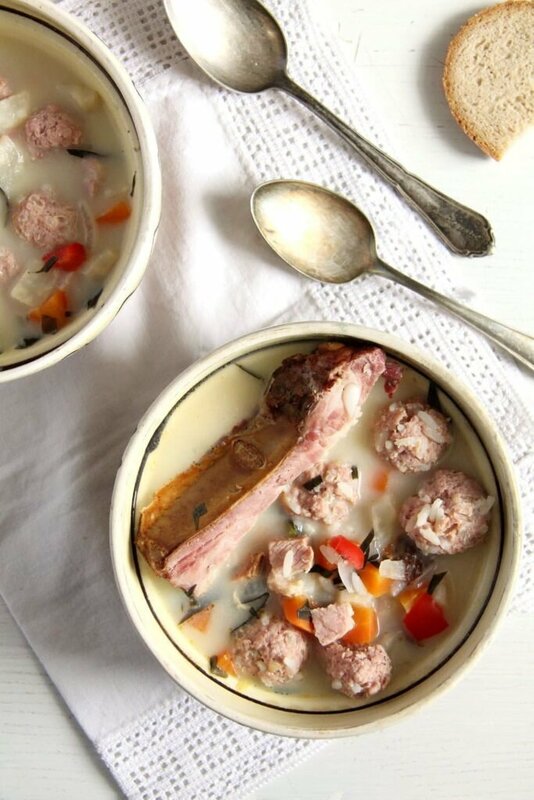 I use smoked spare ribs to give this soup the typical taste. I don’t know how this works in your area, but here I have to order them at the butcher’s a week in advance. They’re not expensive but not particularly popular in the German cooking compared to the Romanian one. I use pickled tarragon for this soup and many other Romanian soups. I don’t think you can buy that, still it is a staple in the Romanian kitchen. I have a huge tarragon bush in the garden planted just for this purpose and to make the pickles, I pick the leaves from the stalks, stuff them into very small jars, press them down well and cover them with white wine vinegar. They keep in the cellar for at least one year, probably even more. For the soup, I usually use a whole little jar, drained well. That is about a small handful pickled tarragon, which I chop finely before giving it to the soup. If you don’t have this, replace it with 1 teaspoon dried tarragon or a small bunch fresh tarragon and add one or two tablespoons white wine vinegar to the soup. Taste after giving one tablespoon and add more according to your taste. I like it on the sour side. Place the smoked spare ribs in a large soup pot and cover with the water. Bring to a boil and cook slowly for about 30 minutes. Remove the foam with a slotted spoon. In the meantime clean and chop the vegetables into small cubes. 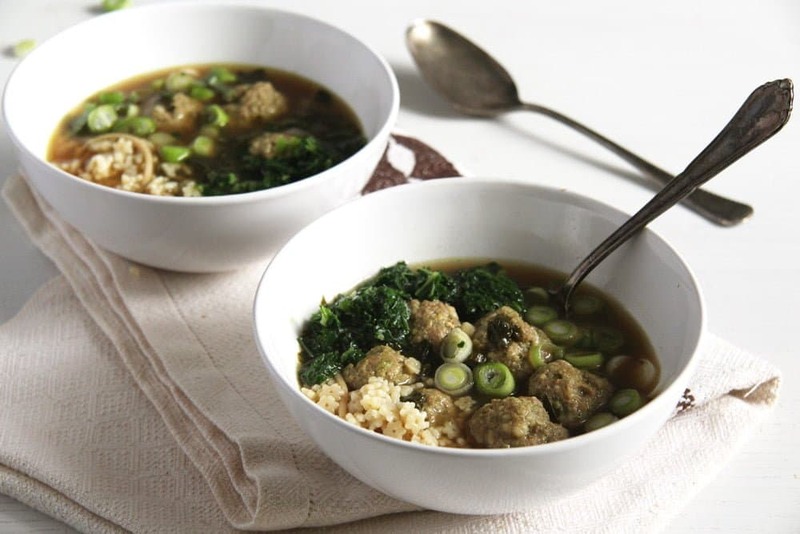 Give them to the soup and immediately start making the meatballs by mixing the ground pork with 1 of the egg yolks and 3 tablespoons of the rice. Add salt and pepper generously. Form walnut-sized meatballs (I had about 35). Place the flour on a plate and turn the meatballs into it, shaking a bit to remove the excess. Give them to the soup together with the remaining two tablespoons of rice and cook on low for about 20 to 30 minutes or until the rice and the vegetables are soft. Mix the sour cream and the remaining egg yolk in a small bowl. Slowly add some of the hot soup to the mixture, about two soup ladles, while stirring all the time. Pour this mixture slowly into the soup while stirring. Do not let it cook anymore. Drain the pickled tarragon leaves, saving a few tablespoons of the vinegar. Chop the leaves very finely and add them to the soup. Adjust the taste with salt and pepper and some of the saved vinegar if necessary. Alternatively add the fresh or dried tarragon to the soup and some white wine vinegar to taste. 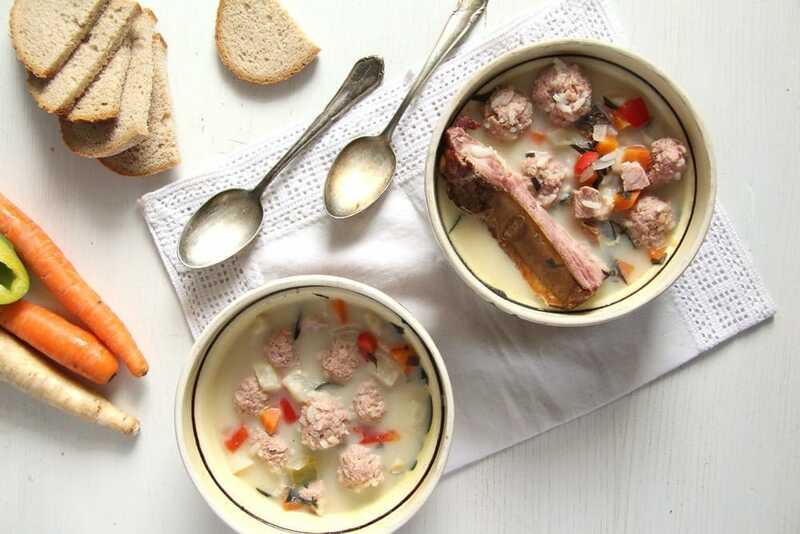 Divide the spare ribs and serve the soup with white bread and hot pickled peppers. Note: the pickled tarragon can be replaced with the leaves of 1 small bunch of fresh tarragon + 1-2 tablespoons white wine vinegar (to taste) or with 1 teaspoon dried tarragon + 1-2 tablespoons white wine vinegar (to taste). So funny how our tastes change so much from childhood to adult. This soup sounds very delicious and comforting. Sounds like you had a traumatic experience with cooked peppers – no wonder you thought you hated them! There have been a few things I thought I hated as a child (sweet potatoes, brussels sprouts) but grew to love as an adult. It’s wonderful having old family recipes. It was traumatic, but I suppose they didn’t know any better in those days… And old family recipe are the best, aren’t they, full of comfort and memories. 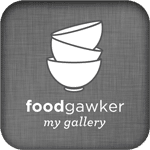 I love all kinds of soups and love learning about this one, which I’d never heard of. It looks really delicious, like a bowl of love right there. : ) It’s funny with food memories and what we end up loving now that we might have hated as kids.